ST GEORGE – Hoping to unseat Republican incumbent Rep. Chris Stewart in Congress this fall, Democratic challenger Charlene Albarran is running a campaign that seeks to promote unity over division. “Unity for Utah is my message,” Albarran said Friday while visiting St. George. Moderate Republican, Democrat and unaffiliated voters who stand in the middle of the road of political ideology are the people Albarran seeks to represent, she said. Clamoring at the edges of the spectrum is not how she wants to work in congress, she added. Everything should be negotiable in Congress and not an all-or-nothing deal breaker, she said. This is how Albarran plans to approach various issues facing Utah and the country as a whole, such as public lands, the environment, minimum wage and other issues. “I stand for the middle ground,” she said. 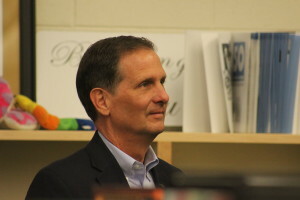 Since Utah’s 2nd Congressional District was represented by a Democrat from 2001-2012 – that being Rep. Jim Matheson – Albarran said it could be again as the seeks that moderate, middle ground. The district itself is large, she said, with the majority of its Democrats situated in the Salt Lake City area and the rest of the district a mix of Republicans and unaffiliated voters. And she seeks to represent them all. There has been some issue in the media about Albarran possibly not living within the district she is aiming to represent. Some reports have listed Park City as Albarran’s home, which resides outside of the 2nd Congressional Districts. While she does maintain a residence there, it is not the place she calls home, Albarran said. Albarran said her home is in the greater Salt Lake City area, which is inside the district. According to her candidate filing information, Albarran listed an address in Salt Lake City as her place of residence. 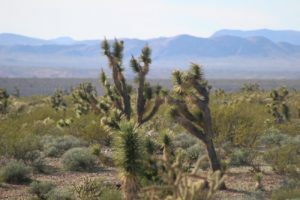 Public lands and alternative power – On public lands, Albarran said she isn’t in favor of the state engaging in a massive takeover. Instead, she favors a piece-meal approach that addresses smaller parcels of land a bit at a time. “I think we should break it down,” she said. Take the small parcel of land and analyze what the best use would be in relation to the state, federal government and local parties like ranchers, farmers, developers and others. Find common ground on land use and go from there, she said. Albarran also supports a gradual shift from fossil fuels to multiple, alternate sources of energy. Over 50 percent of climate change is attributed to the burning of fossil fuels, she said. The issue needs to be addressed, but in a gradual manner, and not in a sudden shoe-drop fashion. Changes in the power industry – such as a move away from coal – will impact jobs. Jobs in Utah must be protected, Albarran said. Replace fossil fuels with solar farms, wind power and other forms of sustainable energy production at a gradual pace that benefits not only the environment, but the people and state overall, Albarran said. “Bottom line, we are the ones who live here and it should it should be to our advantage,” she said. 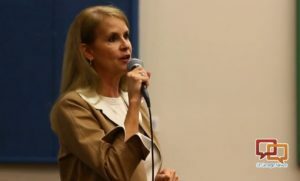 Raising the minimum wage – Albarran has $12 an hour listed on her platform as a possible target for the minimum wage. At the current rate of $7.25, a person can be working full time and be considered to be in poverty, and thus eligible for food stamps and other federal subsidies, Albarran said. “If we raise the minimum wage, these people will be self-reliant and not dependent on government subsidies,” she said. As for raising the wage to $12 an hour, Albarran said that is primarily a starting point for negotiation and not an arbitrary rate. Many who are on minimum wage are in Utah are between 18 and 25 years old, Albarran said. For those going to attend colleges and universities, raising the wage will help benefit them as they see their way through school, she said. Student loan debt – The average amount of debt from student loans is approximately $30,000 or more, Albarran said. The total amount of student loan debt in the United States is $1.2 billion. According to the Consumer Financial Protection Bureau, one in four student borrowers are in delinquency or default on their student loans. The system needs to be structured and a cap needs to be put on the amount individuals can borrow, Albarran said. Ways of making higher education more affordable in general also need to be found, she said. LGBT rights – Albarran supports equal rights to members of lesbian, gay, bisexual and transgender community. 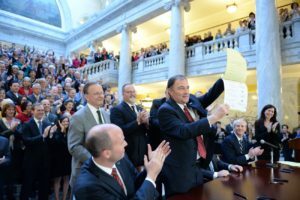 She praised the law the Utah legislature passed last year safeguarding the employment and housing rights of the LGBT community, yet lamented that not all states had such protections. Discrimination against members of the LGBT community has contributed to suicides, Albarran said, adding that it must stop. A fuller treatment of where Albarran stands on the issues can be found on her website. Ed. note: The location of Albarran’s primary residence has been clarified.